2012-06-11 Edit 2: After going through the official Red Hat document for RHEL5 here, the correct way to specify the bonding options should be inside the ifcfg-bond0 file. For MAC address, please assign a value on your own so that it won’t conflict with other MAC address on the network. The main reason why MAC address needed to specified is that bond0 by default will use the hardware address of eth0. When eth1 is down, the hardware address of eth0 will conflict with the MAC address of bond0, which we don’t want to see. Please notice that it should be MACADDR but not HWADDR in the bond configuration file. Remember to replace the value for IP address, netmask and gateway. The miimon options is to enable monitoring of the link status. You may refer to the Red Hat official documentation here or another reference here for more parameters and options available for configuration. For RHEL6, you may also want to include the following line in the file to avoid getting the error Device not managed by NetworkManager when activating the interface. 2012-06-11 Edit 3: See 2012-06-11 Edit 1 for the reason of removing the line HWADDR. Modify the configuration file. Remember to replace the HWADDR with the original hardware address from the Ethernet interface. 2012-06-11 Edit 4: See 2012-06-11 Edit 2 for the reason why option bond0 is deleted. The miimon options is to enable monitoring of the link status. You may refer to here for more parameters and options available for configuration. The channel bonding has been set up and running. However if you are setting up a new server you might be interested in setting up your DNS as well. and append a line prefixed with nameserver for each DNS server. Remember to replace the IP of the DNS server. and see if the it is successfully resolved into IP address for ping. You should see something like this. PING www.l.google.com (72.14.203.99) 56(84) bytes of data. If you are using the load balancing channel bonding, your router may complaint that the MAC address is flip flopping because the same MAC address is appearing in two different links. If the use of load balancing is purely for redundancy, consider using active standby mode. If not, most likely you have to work on your router configuration. Which Network Script to Maintain Manually on Red Hat? If you have notice, there are actually three network scripts on Red Hat. So which file should we edit and maintain if we want to make changes? This directory is used by the Network Administration Tool (system-config-network), and its contents should not be edited manually. For more information about configuring network interfaces using the Network Administration Tool, refer to Chapter 7, NetworkManager. So the answer is, you should only manually edit and maintain network script in /etc/sysconfig/network-script. Not guarantee to work. Add the following lines of code to the configuration file at /etc/sysconfig/network-scripts/ifcfg-ethx, where x = 0, 1, 2 depending on which Ethernet interface you use. If you are sure the Ethernet cable is connected correctly, it maybe cause by the Ethernet device itself. On some Ethernet device, when the Ethernet device is activating it seems causing the device on the other end of the Ethernet cable to shutdown and restart as well. You will notice the LED light on the other side is turned off. The problem is that the OS check if the link is down when the other side of the device is still restarting, which is surely result in no link present. To set up Red Hat Enterprise Linux Server 5.7 in office network with 802.1x authentication and proxy setting. How to set 802.1x authentication? The 802.1x tab is grey out! In the System -> Preferences -> More Preferences -> Network Connections, under the Wired tab, add a new connection. You should be able to configure 802.1x tab. 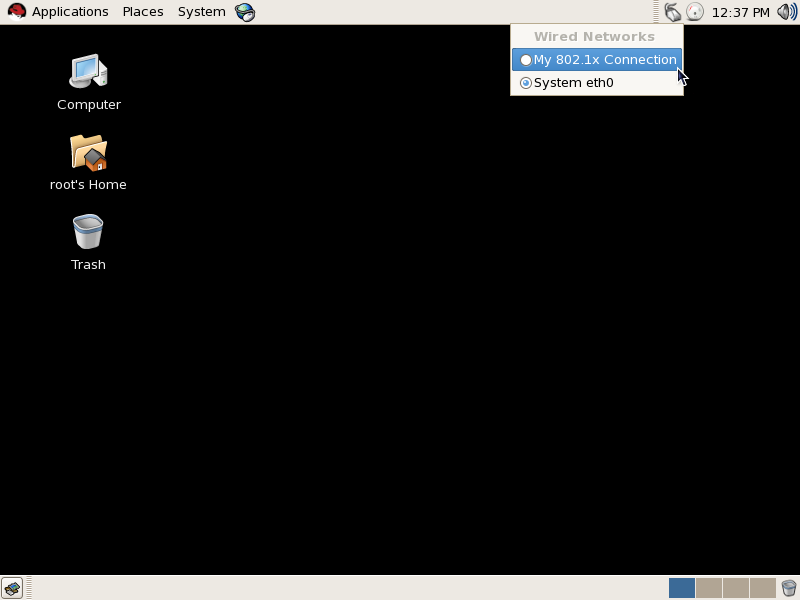 To connect to the network with 802.1x authentication enabled, click on the nm-applet icon in the notification bar, and select the network connection created. But I cannot find the “nm-applet” icon! 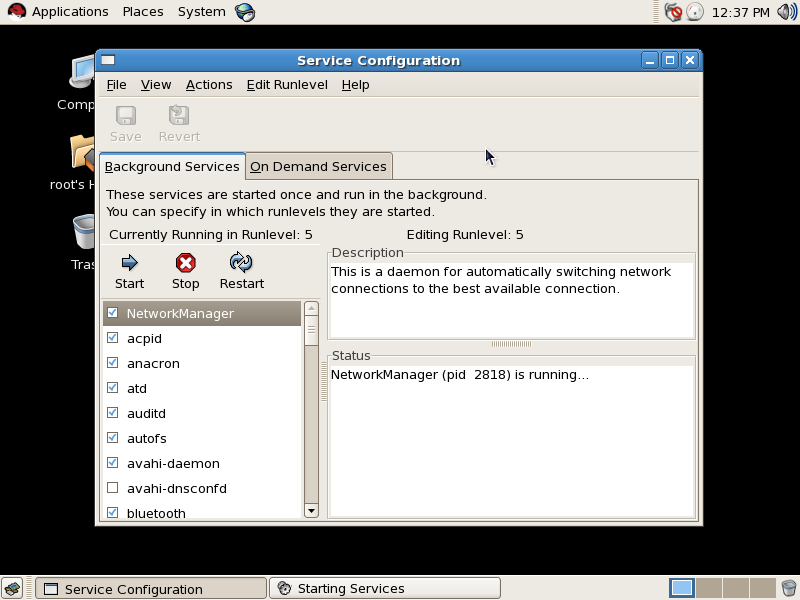 By default, the Network Manager service is not running. 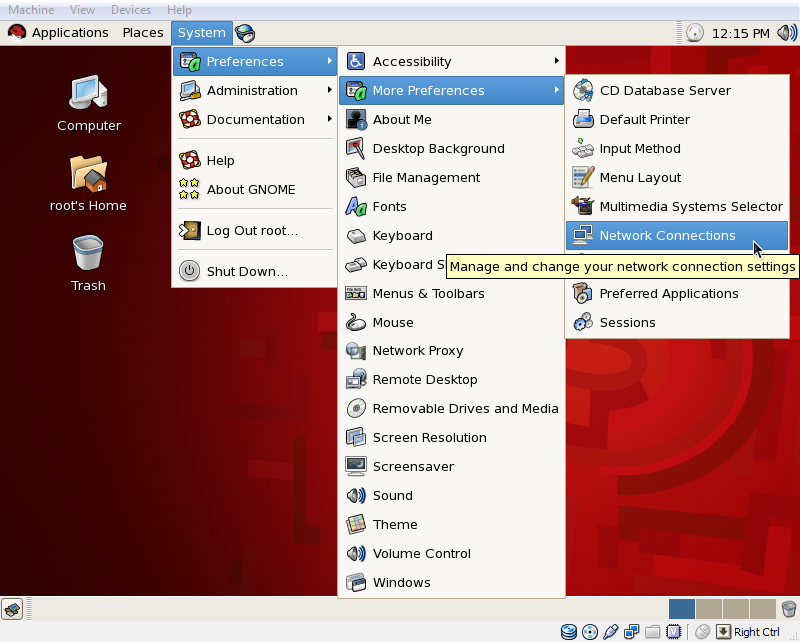 Start the Network Manager service and you should be able to see the nm-applet icon on the notification bar. It seems that it is a bug in the urlgrabber module. Perform yum update once without proxy to update the package on the server and will solve the problem. How to lock screen to prevent others seeing my password used in 802.1x connection? Just press Ctrl+Alt+L. Remember you cannot lock screen if you are using the root account.